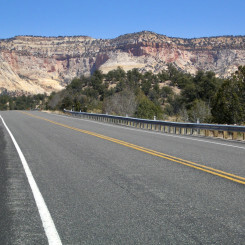 Hayduke: Grand Canyon Bypass – Across Utah! The Grand Canyon is a bit out of the way when doing the Hayduke Trail. 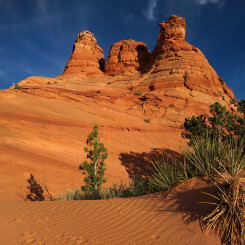 As I’ve written before, I understand the inclusion: it would be a shame for those hikers doing a ‘once-in-a-lifetime’ southwestern trek to miss one of the Natural Wonders of the World. 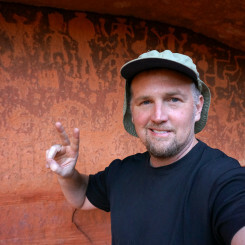 But, if one is like me and has hiked extensively in the Grand Canyon on separate trips, you might opt for this bypass as it’s fairly easy to skip the circuitous route to/from the canyon. Again — it comes down to your experience. 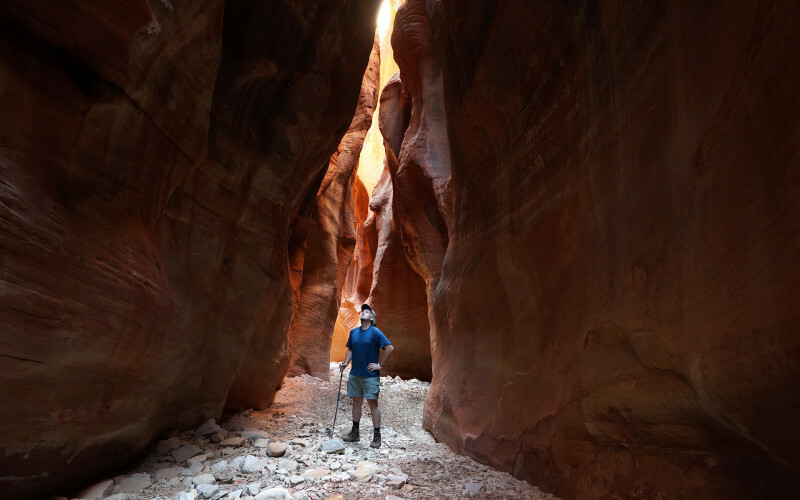 Seriously though, the pros for skipping the Canyon in detail include: over 200 miles shorter, not dealing with GC permit system, no need to cross the Colorado River, ability of doing rest of hike later/earlier in season, easy re-supply in Kanab or Mt. Carmel, and seeing the Upper Barracks. 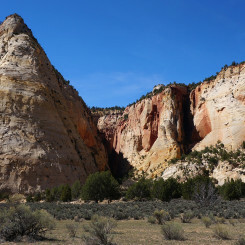 I’ve outlined two good ways to connect the Bryce area to the Zion area. A third route, and potentially the best, is unfortunately blocked by small parcels of private property. More on that later, but the main two routes are described below after the map. Route description for those headed East to West. 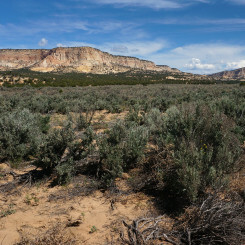 After leaving Bryce, the Hayduke soon heads down Bullrush Hollow where it crosses Skutumpah Road (pronounced “Skoot-um-pa”). 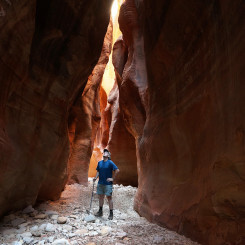 This is the easiest spot to divert toward Zion. 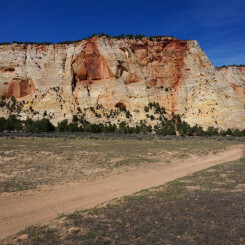 Note that more scenic, but longer, options are available: One could stay on the Grandview Trail under the Pink Cliffs and then take the Meadow Canyon Road down to Skutumpah Road. This route is just a bit longer, but in my opinion is the better route. 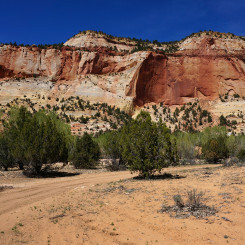 The other option would be to stay on the Hayduke for another 7 miles down Bullrush Hollow/Gorge to the cabin near No Mans Mesa. 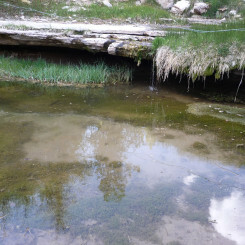 There used to be a reliable spring here, though reports from spring 2016 said it was dry. From here one can leave the Hayduke and go up scenic Lick Wash to re-connect with Skutumpah Road. This route is about 7 miles longer. Whichever way you end up on Skutumpah Road, “scoot” along for 10-18 miles (depending on route). You will pass a few wells and possible streams along the way. Take note when you arrive at where the road begins to turn south and drop down into Johnson Canyon. 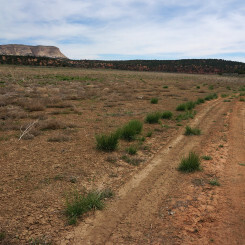 Here it’s possible to follow an old dirt road which short-cuts through the sage brush field to connect with the Glendale Bench Road. Continue on this past some old lava fields for another 7 miles to where the road crosses Kanab Creek at a feature simply known as “The Falls”. There may or may not be water here depending on the season. From here you want to head downstream, but unfortunately it’s private property along Kanab Creek south of this point for about 2 miles. 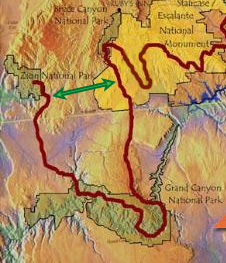 Therefore one must continue on the road west for another half mile where it’s possible to walk down the next draw which is BLM land. 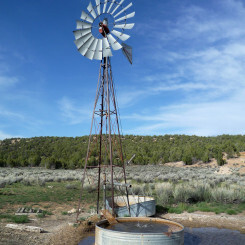 If in need of water, a longer route is to continue on the road for a bit farther and past Fourmile Hollow where there is a minor seep and then descend Threemile Hollow where there is a reliable spring. 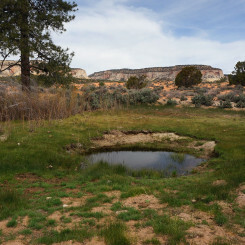 This too is BLM land and like the first draw intersects with Kanab Creek in less than two miles. 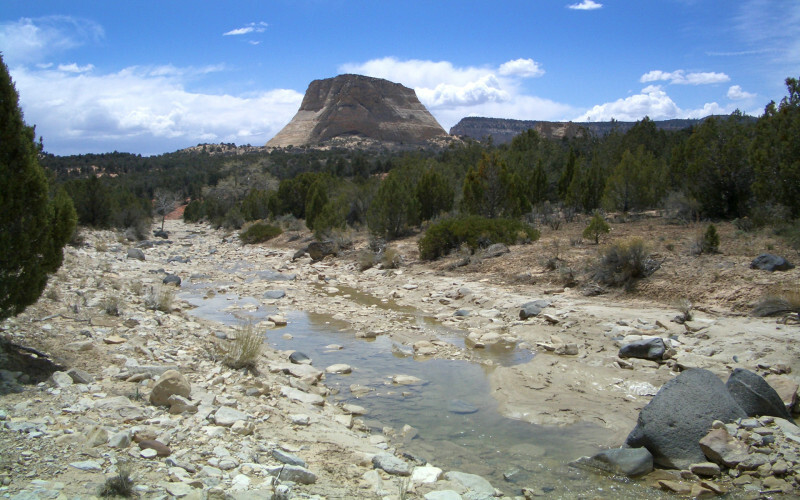 Walk down Kanab Creek (which may or may not have water) as it cuts down through the White Cliffs. 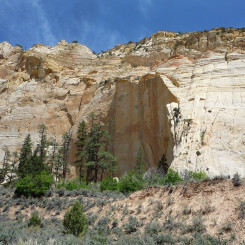 In about 3-4 miles the canyon begins to open up and the prominent White Tower comes into view to the West. 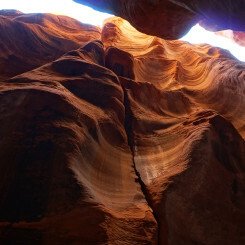 In about another 3 miles one will be at the junction of Red Canyon entering from the west. This is where “north” and “south” alternates converge. 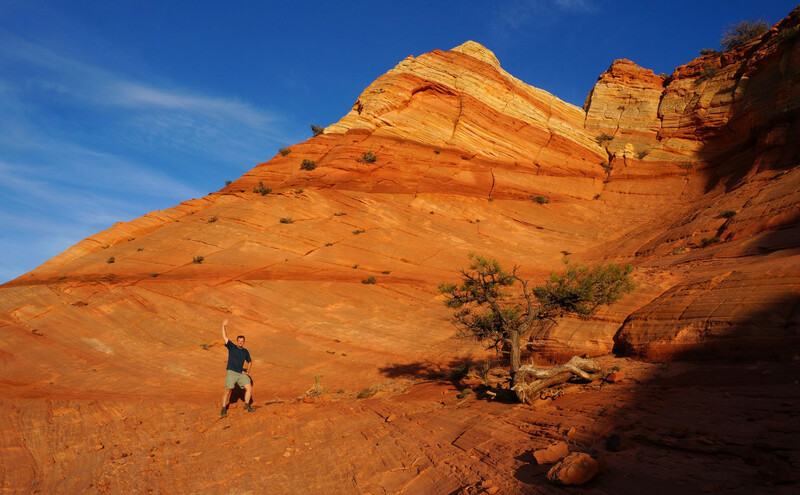 Skip down to Kanab Creek to Zion to continue the description. 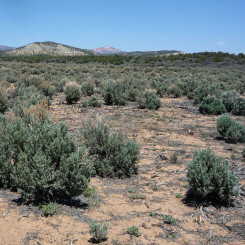 To do the this southern option, continue on the official Hayduke out of Bryce down Bullrush as described and down Park Wash to near Kitchen Corral Point. 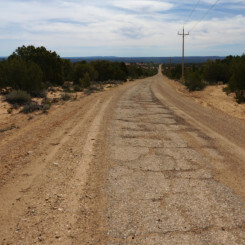 Here a small 4×4 road heads west toward Deer Spring Wash. Follow this and look for (but don’t take) pottery sherds in this area known locally as ‘Potters Hill’. 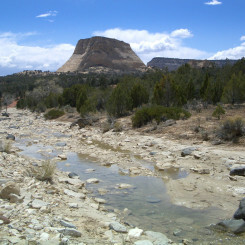 In just over a mile look for a place to cross the wash and head up Nephi Wash. 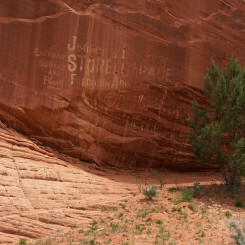 This is easier said than done as the wash cuts through deep sediment in this region and the vertical walls often serve as an obstacle. 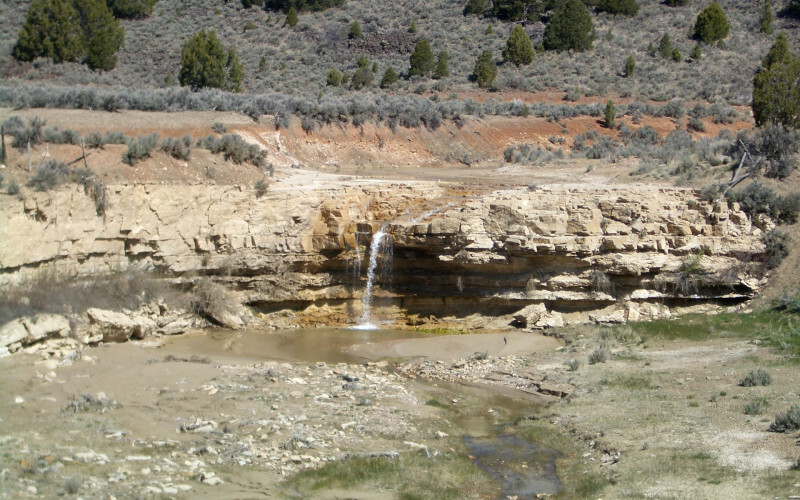 Headed up Nephi Wash one may encounter small outbreaks of water along the way — though cattle frequent the area. 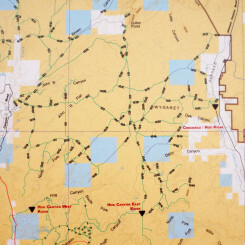 Once past the location of Nephi Spring on the map, it’s possible to follow a 4×4 road up the remainder of the canyon where it intersects a more well-traveled backroad. 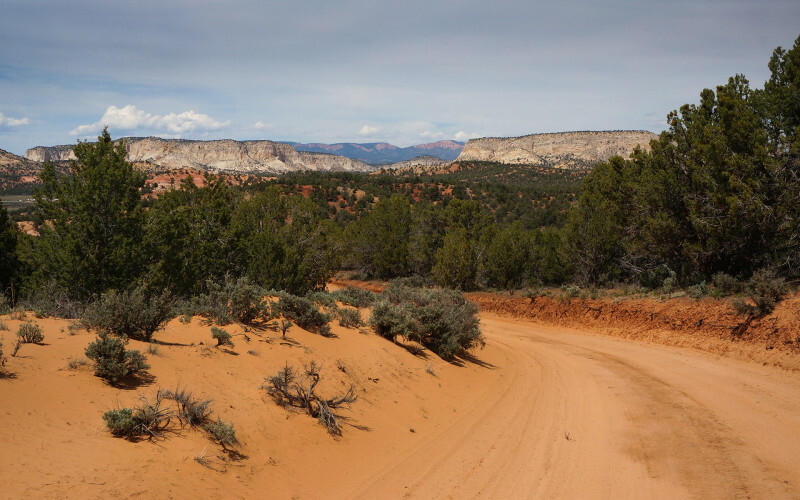 Follow a network of well-traveled roads to the WSW before eventually meeting up with Nephi Pasture Road. Follow this generally west, though leave it for a few short-cuts via smaller roads. This area is frequented by ATVers and though there are some waterworks in the area and green spots on the map, I found NO water along this stretch. 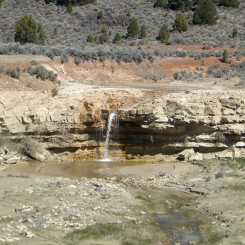 Note that there is a spring up near Spring Point, but it is located on private property. 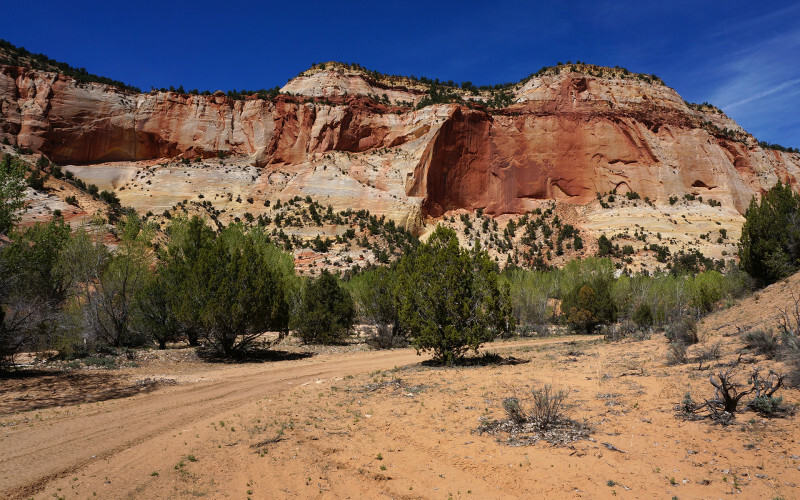 As the route follows the base of White Cliffs it becomes extremely sandy. 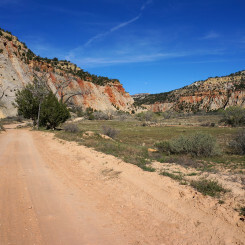 In about 4-5 miles the road descends to Johnson Canyon and intersects the paved road there. At this intersection is a large BLM parking area complete with pit toilets. The goal from here is to continue heading west. Unfortunately a large chunk of private property prevents this. 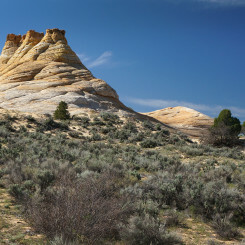 One can walk north along the road and then continue west along the base of the White Cliffs. 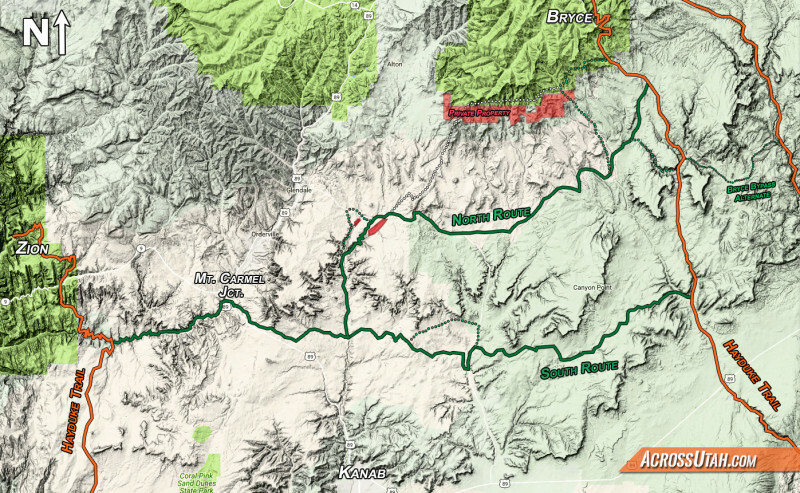 I haven’t tested this, but have heard there are some interesting rock formations along this route. 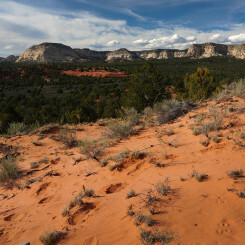 The other option is to head south about 1.75 miles where there is another large parking area and an ATV route heads west. While walking along the highway make sure to see the historical cowboyglpyhs and old Bonanza movie set ruins. 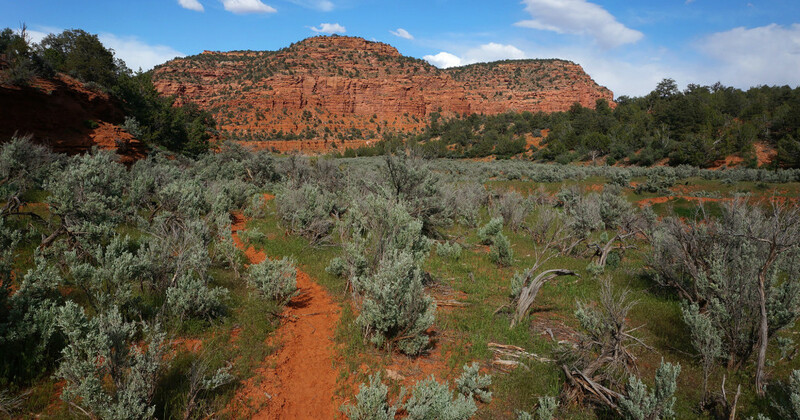 Follow the dirt road around the private property and then head up into the hills toward a prominent outcrop of slickrock known as Red Butte. One can follow the road all the way to this point, though going cross-county will save some mileage. 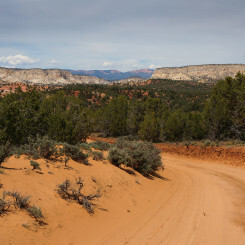 NOTE: if wanting to do a re-supply in Kanab, it’s possible to follow any one of many ATV routes south to the town. Once there you could pick another route back or walk the road to re-connect with this alternate. 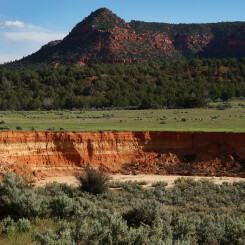 Another route would be to skirt private property and head west from Kanab up the Cottonwood Canyon area. I’m not going to detail these options, but know they are available with some research. Continuing past Red Butte follow the track to where it comes to a fork. Go left and follow this road SW for about .5 mile before leaving it and following a drainage NW to get to he road in Brown Canyon. Follow this road south where it quickly splits. 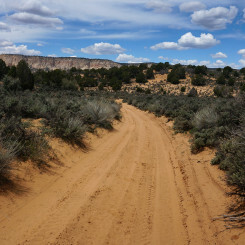 Follow the road to the right which crosses the wash and continues west toward Kanab Creek. 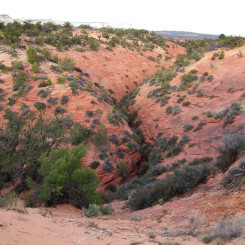 In just over 2 miles one will drop down into Kanab Creek just south of the junction with Red Canyon. This is where the southern route and northern route converge. 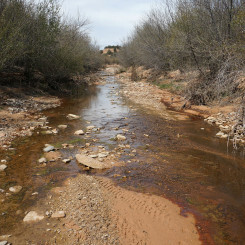 Water usually begins to flow in the where Red Canyon intersects Kanab Creek or sometimes just downstream where a dirt road crosses Kanab Creek. Note that where the road crosses and to the south is private property and one should not linger here. The owner nicely requests that anyone using the road to shut the gates. 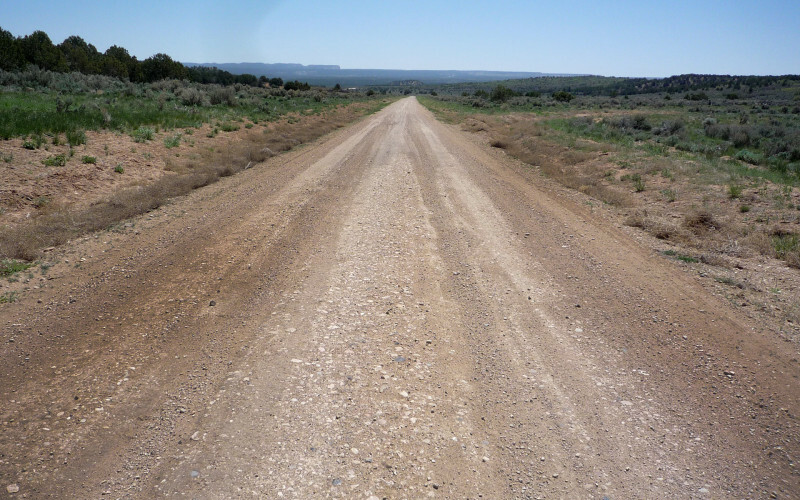 Continue SW through the sandy terrain until you intersect the old paved highway. If you come out at the right spot you might find water at a mini-oasis. From here follow the old road NW toward the prominent cliff known as Diana’s Throne. From here one is very close to Highway 89. 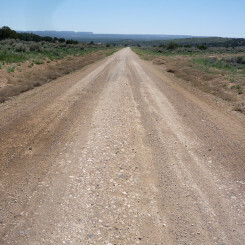 One can follow the highway or any of several parallel dirt roads heading NW to the bottom of the hill near Mt. Carmel Junction. Though untested and likely slower, it also looks possible to descend the drainage/wash cutting down west of the White Cliffs. 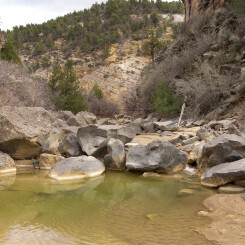 In any case one should soon be at the road which runs along the East Fork of the Virgin River. Follow the well-traveled dirt road ESE toward the Barracks. Along the way you will pass by several parcels of private property — so stay on the road. 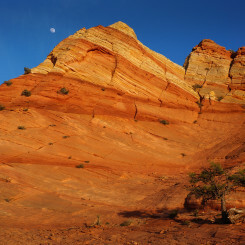 The cliffs along this stretch are very colorful and quite scenic. After about 4 miles the road becomes more of a 4×4 road and crosses the river several times. 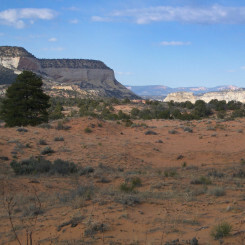 In another couple of miles the road turns south on a true 4×4 route climbing the hills toward the Elephant Butte area. Continue heading down river. 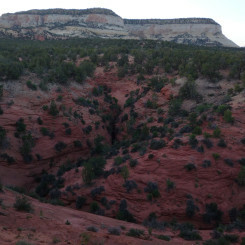 About 2.5 miles down the canyon Mineral Gulch enters from the north. 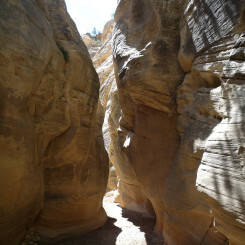 If time allows, a diversion up this canyon leads to some good narrows. 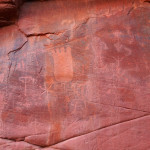 There’s also some prehistoric caves and petroglyphs near the bottom. Continuing downstream the canyon begins to get deeper and more scenic. 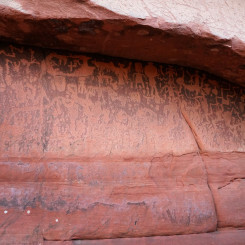 Just about 2 miles down from Mineral Gulch and right before Rock Creek enters from south, look for a large petroglyph panel on the northern wall. Then just a few more bends down the canyon is where the official Hayduke enters the Barracks after its long trip down and back from the Grand Canyon. As mentioned before, there is possibly a better route, but unfortunately several small parcels of private land block access. 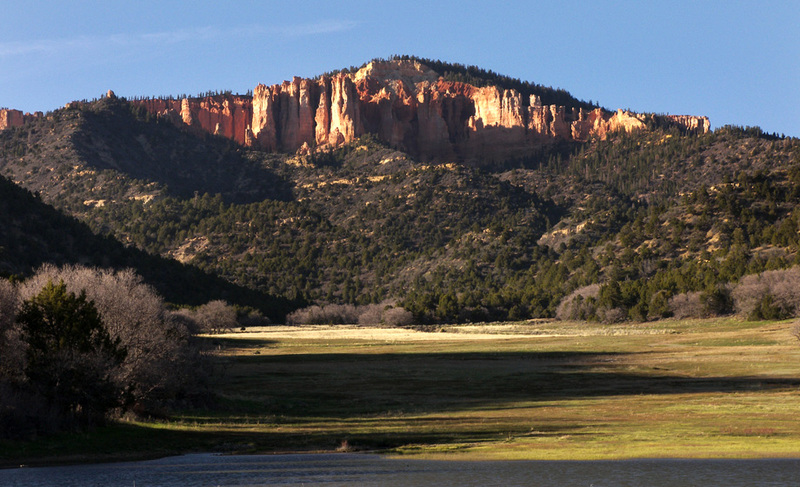 Upon leaving Bryce it is possible to continue west along the Grandview Trail in the Dixie National Forest. 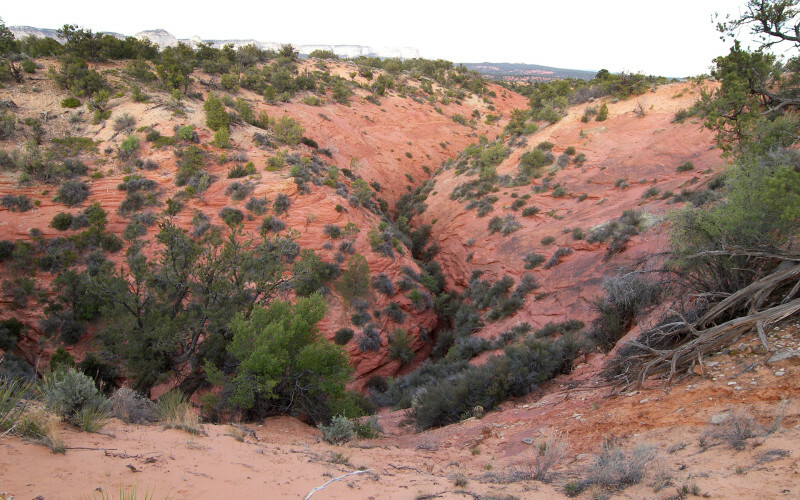 This scenic route snakes underneath the Pink Cliffs much like the Under-the-Rim Trail in Bryce. 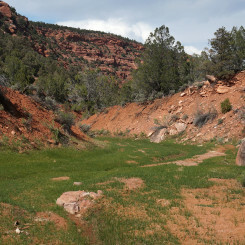 It’s possible to leave this trail and follow one of several roads/tracks down and out of the hills and connect with the Glendale Bench Road near Kanab Creek. I have done this, unfortunately I later found out that the road does NOT act as easement similar to locations within GSENM farther east. Hopefully at some point in the future this may change. 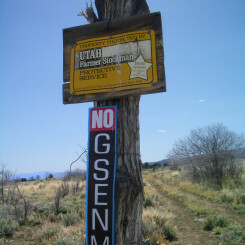 not everyone loves GSENM. make sure to not trespass here!